Each year the Society hosts a public lecture at the Saskatchewan Geological Open House in Saskatoon and a separate public lecture in Regina. 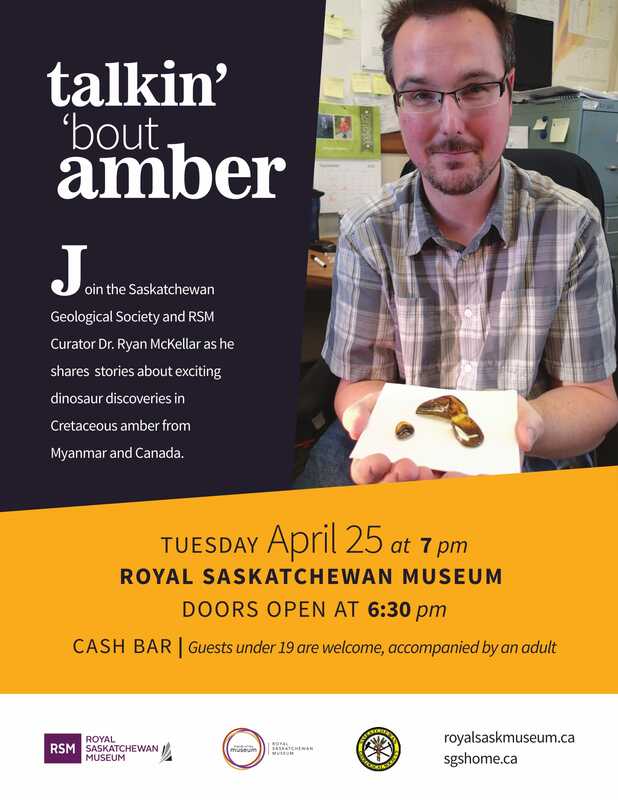 On April 25th, SGS and Royal Saskatchewan Museum hosted a wonderful talk by Dr. Ryan McKellar about the life traces discovered in pieces of amber from Myanmar and Canada. Dr. McKeller talked to a crowd of about 80 people of all ages about this new idea of feathered dinosaurs. Few pieces of amber were on display, and the public had the chances to observe them under microscope. 2015- Dr. Grant Zazula, Mammoths and other Ice Age mammals. 2014 - Dr. Niziar Ibrahim, University of Chicago: Bigger than T. rex:The hunt for the largest predatory dinosaur. A free public lecture in the Battlefords Room, Delta Bessborough Hotel, Saskatoon Saskatchewan.